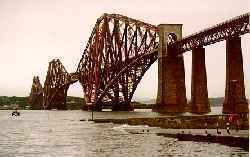 The Forth Bridge is still in use by trains today. The bridge is owned by Railtrack. ScotRail and other Intercity services use the bridge. The Forth Bridge Railway was joint-owned by a number of railway companies and ran from Inverkeithing station to Dalmeny station. The bridge is also known as "The Forth Rail Bridge" by some to distinguish it from the 1960s "Forth Road Bridge". This bridge crosses the Firth of the River Forth at Queensferry. At the North end of the bridge is North Queensferry with the nearby Rosyth Dockyard and to the South end is South Queensferry. There is car-parking on both sides of the bridge where one can stop and admire the bridge. At night the bridge is lit. Building the bridge was such a major undertaking that it was not built until its construction and use were long overwaited. Before it was built a number of train ferries operated over the Queensferry route from South Queensferry to North Queensferry, both railway terminii. (For the new bridge new approach lines were built from the north and south and the existing lines became humble backwater routes). The line and bridge were jointly maintained by these companies until the 1923 grouping. The line was operated by the North British Railway. From North Queensferry to South Queensferry linking Fife to West Lothian. This is to the South of the bridge and Dalmeny station. To the South of this point are the Forth Bridge Connecting Lines built by the North British Railway to link to the Forth Bridge Railway. The original line in this district is the South Queensferry Branch which ran from Ratho to South Queensferry via Kirkliston. This line is now closed save for a short section of track which was common with the Forth Bridge lines at Dalmeny Junction. To the north runs the main line onto the bridge, and the closed line to South Queensferry. To the south are the lines to Winchburgh, Saughton and the closed line to Ratho. This station is located at the south end of the bridge. The station retains its original buildings. One of the wonders or Victorian Engineering. This station is located at the north end of the bridge. The station retains its original buildings. The section of track between the north end of the bridge and Inverkeithing station was very expensive to built - it runs at high level along embankments and through tunnels to reach Inverkeithing, including a large viaduct which spans a road and the line to Rosyth Dockyard. Immediately to the north of the Ferry Hills the line crosses the large Jamestown Viaduct, which also crosses over the line to Rosyth. By this viaduct is the large Park and Ride system from which buses run over the Forth Road Bridge to Edinburgh. This junction is immediately to the South of Inverkeithing station and may be viewed from it. The north end of the Forth Bridge Railway terminates here. The line joined the older Dunfermline and Queensferry Railway, approaching from the South, passing over the line to Rosyth and joining the line from the west at a junction facing north.